Our finished 17" + 15" Timpani are an unequal pair of hand spun copper bowls one 17" (45cm) diameter and 14" (35cm) deep and the other 15" (37cm) diameter and 13" (32cm) deep. Our finished 17" + 17" Timpani are a matching pair of hand spun copper bowls each 17" (45cm) diameter and 14" (35cm) deep. Polished and lacquered each bowl is fitted with a goat skin head, rope tensioned in the traditional manner with sliding leather buffs. The finished timpani can be played as either floor standing instruments using the wooden stands provided or in 'mounted' fashion across horseback. Usually struck with soft headed beaters, harder headed beaters can be used to produce different tones. The finished timpani come complete with a pair of beaters and two stands. 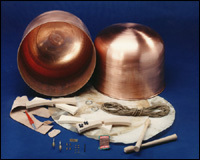 The same Timpani sets are offered in kit form for home assembly. The kits provides the builder with a pair of hand spun copper bowls, two skins, hemp rope, leather for buffs, wooden drumsticks and all accessories. No wood craft skills as such are necessary, all that is required is to fit the two goat skin heads using the hempen rope and sliding leather buffs supplied. An instruction manual takes the builder through each stage including how to make an authentic pair of soft headed beaters. 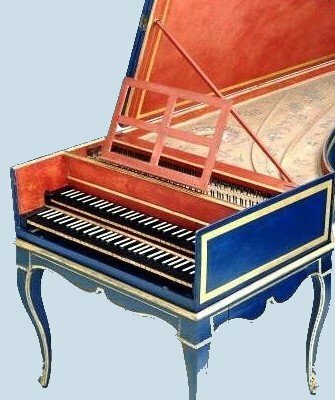 You can make the same Timpani from scratch, following detailed step-by-step instructions through the construction process in a clear and concise manner.